Empowerments belong to the vajrayana level of the Buddha’s teachings – in the West the vajrayana is often simply known as Tibetan Buddhism. The vajrayana consists of highly effective methods that are practised and based on other teachings of the Buddha; they form a part of mahayana Buddhism. The empowerments are the required “gateway” through which the practitioner enters his practice of the vajrayana. Basically the object of such empowerments is to guide the practitioner to a profound understanding of the nature of his mind, the nature of reality. Proceeding from this initial impulse, the practitioner goes on to deepen his understanding by means of consistent practice. During the outward, ritual aspect of the empowerment, the vajrayana master recites the prescribed text, accompanying the meditation with ritual instruments. He also uses certain symbolic objects like a vessel and several small images. The vajrayana master eventually touches the practitioners with these objects to show that the individual constituent parts of the empowerment have actually been transmitted to them. Having received such an empowerment it is essential to maintain the associated samayas (commitments). In fact, practicing the vajrayana means to cultivate these commitments through consistent practice. Buddha Shakyamuni guided his disciples according to their capacities. One of these ways of guidance consisted in the methods of the so-called Buddhist tantras or the vajrayana. They are considered the peak of Buddhist methods and are part of mahayana Buddhism. There are various ways of categorizing these teachings. Frequently they are distinguished as follows: the kriya-, carya-, yoga- and the annutarayoga-tantras. Each type of tantra has various sub-divisions with their specific types of empowerments or initiations and ways of practicing. Empowerments or initiations play an essential role in that they make the vajrayana practice possible. The practice based therein consists of two main stages associated with so-called yidams (Buddha-aspects) whereby yidams are different expressions of buddha, the enlightened state. These two stages are the generation- and completion stages. 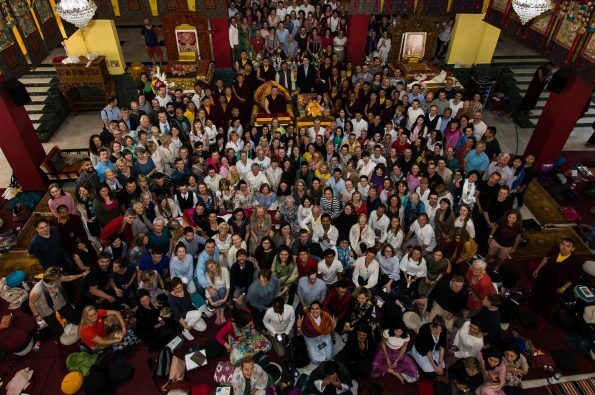 In the generation stage, the practitioner generates the world of the sambhogakaya. In the completion stages, the practitioner completes his understanding of ultimate reality, i.e.of the dharmakaya. All in all it is through these two stages that the practitioner aims to overcome all those tendencies which trap him in cyclic existence. By applying the practice based on the empowerment, the practice of the Buddhist tantras, the practitioner aims to achieve freedom from the mental patterns that otherwise make him live a samsaric life and make him go through death towards the next rebirth etc..
A sub-category of empowerment is the so-called “subsequent permission” which is in many cases given to the disciples in public. It permits them to engage in the corresponding type of meditation practice, such as, for example, the one of Avalokiteshvara (Chenresig).